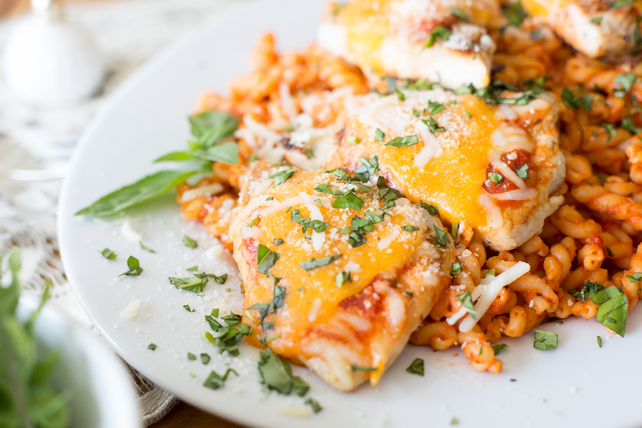 This easy pasta dish, made with grilled chicken, mozzarella and Parmesan, is really good. What's even better? It can be ready in just 25 minutes. Combine shredded cheese and 1/4 cup Parmesan. Cut 3 Kraft Singles in half. Cook pasta in large saucepan as directed on package, omitting salt. Meanwhile, grill chicken 6 to 8 min. on each side or until done. Top each breast with 1 Tbsp. pasta sauce, about 1-1/2 Tbsp. of the shredded cheese mixture and 1 Singles piece. Grill 1 min. or until cheeses are melted. Remove from barbecue; cover to keep warm. Drain pasta; return to pan. Stir in remaining sauce and Singles; cook and stir 3 min. or until sauce is heated through and Singles are melted. Spoon pasta onto platter; top with chicken, remaining Parmesan and basil. Prepare using your favourite bite-size pasta such as rotini, penne or farfalle (bow-tie) pasta. Add 2 to 3 tsp. crushed red pepper to the drained cooked pasta with the remaining pasta sauce and Singles.